In one of the biggest reverse mortgage deals of 2012-2013, Ocwen Financial purchased Liberty Home Equity Solutions from Genworth Financial for a total of $22 million. With a nationwide footprint and operations spanning retail and wholesale, Liberty says it is positioned for growth under its new ownership. From plans to roll out a new correspondent channel to a longer term eye on new products, Liberty President and CEO Pete Engelken shared with RMD his take on Liberty under its new parent company. RMD: What does this new ownership bring to Liberty’s position in the reverse mortgage market? How does Ocwen’s position as a major mortgage servicer reposition Liberty? Pete Engelken: We are very excited to be part of Ocwen Financial (Ocwen). As a leading mortgage servicer and originator, Ocwen brings a deep understanding and commitment to the mortgage industry. With Ocwen as our parent company, we will have greater access to growth capital, infrastructure support and resources that are needed to support our business strategies and growth plans. We will continue to look for opportunities to grow and maintain our leadership position in 2013 for both retail, wholesale, and correspondent channels. RMD: Will the parent company’s reach expand marketing opportunities for Liberty? PE: We plan to continue to drive our marketing strategy to reach new customer segments through new campaigns, messaging and media channels such as TV. We also see greater opportunities for growth through synergy marketing programs and new partnerships with realtors and financial professionals. RMD: With Ocwen as an approved issuer, what are the plans for issuing HMBS? PE: Liberty has been an approved Ginnie Mae issuer since 2011 and we are currently actively issuing HMBS securities. We will continue to evaluate secondary market outlets as part of Ocwen, and we will continue issuing Ginnie Mae securities as needed to support our business growth. Liberty has grown volume in recent months. Where is the future growth opportunity? Retail, wholesale, both? What about origination strategy between phone originators and those in the field? PE: Liberty had a very strong year in 2012 across both our retail and wholesale channels and we are positioned to continue to grow both channels in 2013. In retail, we plan to continue to expand both our inside and field sales teams. We believe that it is important to have a flexible sales model based on the needs of our senior clients. Some of our clients prefer to take out a reverse mortgage by working with an advisor exclusively over the phone while others prefer to meet “face-to-face” with a local advisor. For our wholesale business, we plan to continue to expand our product offerings including the introduction of a full-correspondent program planned for Q2, 2013. Our secondary market team also continues to investigate opportunities to launch new proprietary products which will enables us to tap into new customer segments. We also have invested in enhanced technology and training capabilities to support our internal and partner growth plans. Our Liberty University provides courses to help Liberty associates improve their customer, product and job knowledge through live and web-based sessions. For our wholesale partners, we offer training courses on-demand and live through our Liberty Academy. We recently delivered a new HECM LIBOR course that was attended by over 350 wholesale partners. For financial professionals, we have launched a very successful educational webinar series that is attracting over 500 financial planners per month. 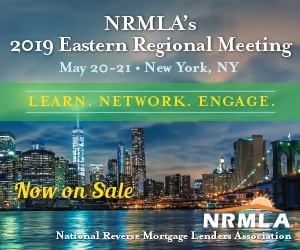 RMD: How does the timing of this acquisition present an opportunity for Liberty given the recent FHA reverse mortgage product changes and more anticipated by year end? PE: We believe that the demand for reverse mortgages will continue to grow as more seniors seek new ways to fund their retirement. Recent changes to the FHA reverse mortgage offerings will help ensure the long-term viability of the program and help protect seniors. We expect these changes and any future FHA modifications to have a positive impact on the reverse mortgage industry sustainability over the long-term.